The Alfa Romeo Giulia is heralding the Italian brand’s comeback to America by embracing its heritage: providing an amazing driving experience while managing to have failures on a regular basis. Owners are reporting a multitude of issues online, and it seems like every car that gets sent to a journalist has some type of failure that requires a trip back to Michigan. The failures are widespread, but explanations are far and few between. Luckily, there is one way we can get an inside look at the issues that Fiat Chrysler has been tracking. Tech Authority is a subscription-based Mopar service site that provides dealer-level service information to independent shops and individuals for a small fee. Selecting the Giulia brings up all the service and parts information along with 11 Technical Service Bulletins (TSBs). Manufacturers usually release these bulletins for recurring issues that are not safety related. They’re created with input from engineers as well as technicians, and the final repair procedure might be created by either side. TSBs are recommended repairs for non-safety issues and are usually not applied proactively. A customer has to complain about an issue that matches the description of the TSB in order for the repair to be applied. The next step up for a TSB at FCA is what is called a Rapid Response Transmittal, or RRT. In the case of the Giulia, nine of the 11 TSBs listed on the Tech Authority site are marked as RRTs—that means they carry a bit more importance than a standard TSB as they often recognize issues that appear more often and for a specific range of VINs and may be applied by the dealer proactively to unsold cars or ones that might come in for standard service even if there is not a customer complaint. Let’s run down the issues, shall we? The first standard TSB for the Giulia is 02-003-17 and it describes a customer complaint of a steering chatter when steering is at full lock. There is no resolution for this one as it states that the customer should be informed that the chatter is a feature of the “AlfaTM Link” technology which allows an Ackerman angle change to provide the lowest amount of understeer in most driving conditions. 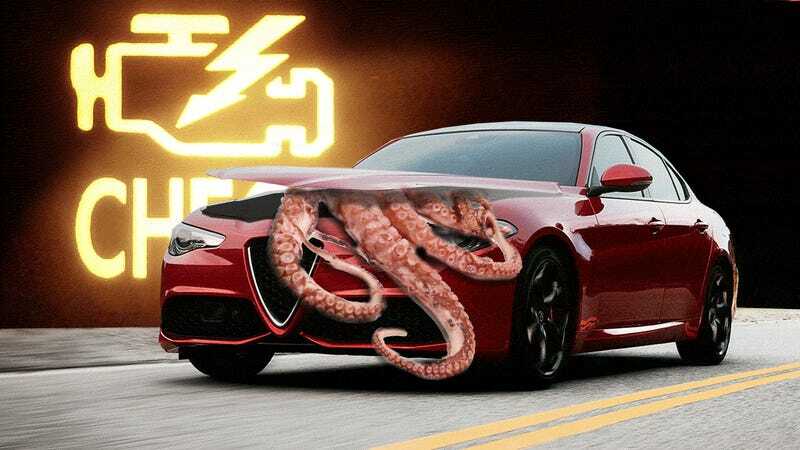 This type of bulletin is not isolated to the Giulia as it has appeared for other cars like the Corvette which use similar steering technology and sticky tires. TSB 24-002-17 is the other standard TSB which covers the Start/Stop system along with the heated seats. The update changes the programming to allow the rear defrost to continue to function during a Start/Stop operation along with turning up the blower fan. It also updates the heated seat logic to start them at max when the button is first pressed. We jump into the RRTs with brake bulletin 05-004-17 which tries to correct an issue where the brake pad wear sensors may get disconnected. The fix seems more backyard mechanic than engineer, as it requires securing a grommet on the harness by wrapping tape on each side of it so it is built up enough to prevent it from sliding down the harness then using a zip-tie to secure the harness to the brake caliper bracket. RRT 07-004-17 has been through a couple of revisions but seems fairly standard and describes a coolant hose retainer that has been upgraded from a zip-tie style to a clip style retainer in order to prevent it from breaking and causing the hose to be punctured from rubbing. This procedure pays 0.4 warranty hours or 24 minutes which covers the whole time from the technician pulling the car in to completing the repair and pulling it out. No Alfa TSB list would be complete without some electrical issues and RRT 08-026-17 is the first one that falls under that category and describes a problem with the body control module that requires an update in order to make the remote start work consistently. The next one (08-027-17) also requires an update to the BCM along with an update to the radio frequency hub module in order to fix an issue where the forward collision warning system may turn itself off intermittently along with a repair to the fuel gauge to fix an issue where it showed a bar on the fuel gauge even if the tank was empty. I suspect that some of the stalling issues are related to this gauge malfunction as owners might be driving their cars on an empty tank and causing it to stall or shut down. The largest electrical update is 08-041-17 which covers the infotainment system and some safety equipment. It fixes a wide array of issues such as the screen locking up or the navigation losing signal and not recovering. It also calibrates the oil status display to show the correct oil level. The best part of the issue list is related to the lane departure warning system as this update fixes an issue where the lane departure options were appearing in cars that were not equipped with the system. The last electrical bulletin (08-060-17) is an update to the adaptive cruise control to fix an issue where the wheel speed sensors would lose signal, causing that system to malfunction and a DTC to light up. There is only one engine performance RRT (18-025-17) for the 2.9-liter twin-turbo V6 engine and it corrects an issue that causes the car to lose its immobilizer code after a remote start operation and light up the check engine light for an invalid key. The 2.0-liter turbocharged four-cylinder engine has a much lengthier engine performance RRT (18-030-17 REV. B) which is now on its third revision and describes an issue that is very similar to the one shared on these pages last week. The RRT describes and array of codes that might be displayed including ones that relate to the throttle body and the evaporative emissions system. It states that the vehicle may experience these issues immediately after fueling and may also be prone to stalling. There is no explanation on the source of the issues but it does state that all of the affected vehicles were built prior to April 18, 2017 so newer builds might have already been corrected. Based on the list of codes in the RRT and the relation to fueling, I speculate that that the updates are trying to correct logic for how the car reads fuel level and pressure and how it interacts with evaporative emission systems. These issues may also be related to RRT above since it also deals with improper fuel level. The last RRT (21-032-17) in the list covers the 8HP50 transmission in the 2.0-liter models and attempts to correct a condition where customers are experiencing bumping or jerking after a Start/Stop event. This is another software enhancement which does not require any physical repair. Most of the repairs are short and involve software updates but most also do not pay very much warranty time to the technician. The software updates usually pay out 12 or 24 minutes to the technician to check the VIN against the RRT list, connect a scan tool to check for the condition, connect a battery charger to maintain voltage, and reflash the car along with any calibrations that may be required after the flash. Except for the bulletins related to remote start, most do not have a paying time allotment to road test the car. These types of bulletins are not unusual for a brand new car, but the frequency and severity of issues seems to be above average and may be related to the rushed development of the car. These bulletins are also only issues that FCA has recognized as widespread at this point since browsing the owner forums will reveal a multitude of others which may not have been recognized yet. The issues also are not isolated to U.S. market cars as the list of campaigns and updates for the European market is even longer, according the Alfa owner forums. Requiring multiple revisions for some of these campaigns does not inspire a lot of confidence but many seems to be tied to early builds of the car so the ones coming off the boat now might be improved. The Giulia has all the right ingredients to be a successful sports sedan, but FCA might need to bake it just a bit longer to work out all the performance issues. Bozi was born in the land of the Yugo but grew up flipping Chevys in the Southeast US. His automotive background ranges from running a used car sales and service facility to building junkyard LS engines and fixing endurance cars.